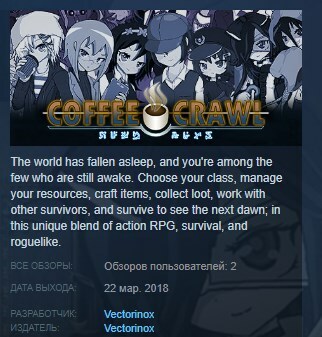 Coffee crawl is a mix of action RPG, survival, and roguelike; that means permanent death. You play as one of the survivor who must find the source of the phenomena and put a stop to it, since you have nothing else to do. There´s a slight learning curve in this game. You can learn the basic from the tutorial, but most stuff and interactions need to be discovered by player themselves, by playing and dying. Play by the rules, or go anarchy and do whatever you like. Just don´t get caught.